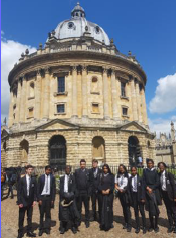 Excited, anxious and curious were among some of the emotions we felt when we were going to visit the University of Oxford on Thursday 10th May. 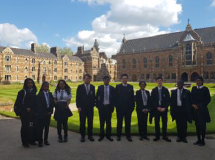 Most of us felt overwhelmed by the opportunity to visit one of the top most prestigious universities in Britain - even the world! 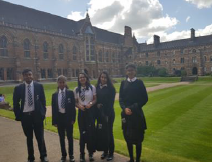 The architecture had grasped all of our attention, especially where we were hosted at; Keble College. It was truly magnificent to take in all the enriching history of the building. We were firstly given a presentation detailing the superb opportunities universities provide people, and were fascinated by the diversity of the courses you could choose from. It was surprising that people could choose a course such as biochemistry, but then find a job in something completely different, such as journalism. We were educated about the different aspects of university life: social life, independent studying, societies available to join and so much more. 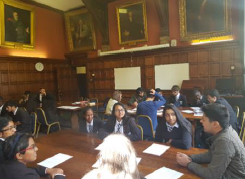 In addition, we learnt what we need to focus on during our GCSE and A-Level studies in order to achieve our best and be able to apply to reputable universities. colleges. The door is opened for five minutes and it is the only time during the year that this door is unlocked. The tour was very useful as we absorbed many details of what some of the colleges had to offer and we saw first hand how students live there every day and what they have access to. For instance, Brasenose provides delicious and affordable food in both their 16th-century dining hall and café, as well having libraries that are open 24 hours a day. They have their own sports ground and boathouse, and a large common room with entertainment of many kinds. There was a workshop afterwards during which the university students answered all our questions and we gained more information of actually studying and living at Oxford. We were humbled by the colleges’ inclusive and diverse community; the students expressed delightfully how they love having friends of all backgrounds, who are studying different things but are still very close to each other. We had concerns that every moment will just be about studying and learning, which was not true at all! The students enlightened us with the fact that people can have a social life, take breaks and simply enjoy their time with their societies, friends and go back home to visit their families as well. Furthermore, financial issues were addressed, students shouldn’t worry about money as the university has lots of funding and are very generous and kind about helping students out with their problems. So students don’t have to worry about unnecessary issues - which relieved a few minds. Talking with the students personally helped us get a better insight into what difficulties they faced and how everything operates in a university. We toured around the city for a brief moment as well. 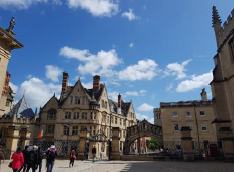 Some of us felt we were in another world of its own as we were faced by the architectural beauty of famous authors such as C.S Lewis (author of The Chronicles of Narnia) being inspired by Oxford; it seemed like we were walking among them. Thereafter, we received three lectures from Postgraduate PHD students. We found this experience educational as we had insight into how passionate students have to be about their courses to be able to effectively learn about it and apply that knowledge to make a difference in the real world. The event had left us all speechless as it has put to rest some of the worries about going to a unveristy like Oxford or Cambridge. It was a great inspiration to work harder for our GCSEs and A-Levels to be able to one day attend university.